Worries surround us every day. However, as time passed, we always realize how trivial those problems are in comparison. Worry Capsule Tree is an interactive installation that listens and stores people’s current worries and sends those back to them in the future, thus allowing its users to retrieve their previous worries and revisit the past selves. When the user comes to the installation, he will see our tree with a computer and a microphone in front of it. The interface on the computer screen will instruct the user to say “hello” to the tree. 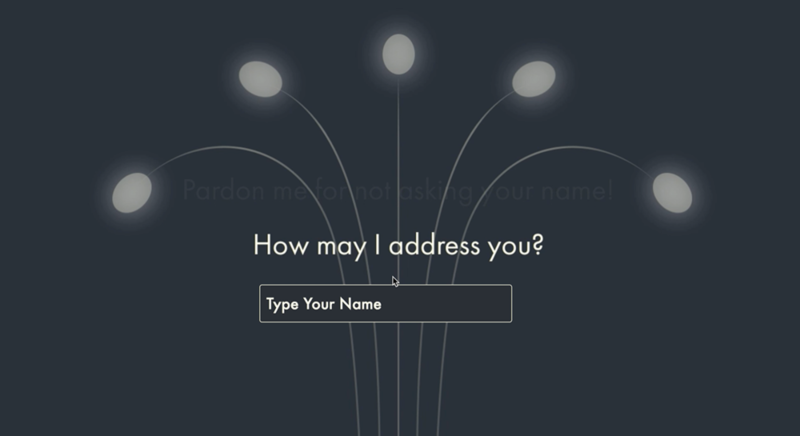 The greeting from the user will trigger the tree to communicate with him and encourage him to tell it the current worry he holds. The tree will listen, remember and store the worry from the user. When the worry is being stored, the tree installation will be gradually lit up. In the end, the user will find his worry being stored in one of the capsules on the tree. The user can choose to tell his contact information to the tree to get his worries retrieved in the future. 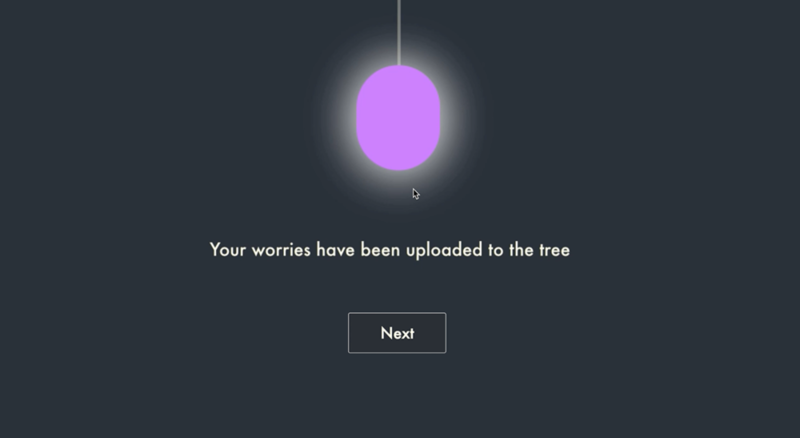 The original idea of Worry Capsule Tree comes from one of the creators Yuan’s desire to release daily stress by keeping his anxiety into a safe place. After Yuan talked to me, this idea of telling and storing worries reminded me of the time capsule, whose function is to help people store memories that are accessible a long time later. Both of us liked the concept of storing current anxiety and retrieve it in the future. On one hand, it helps release the stress we have now, and on the other hand, it provides us with a chance to re-visit our past selves and see how much we have overcome and grown. “how would the users best communicate with this capsule?” and “how do they emotionally engage with the device” becomes very important. These questions triggered us to first think about the appearance of our device. Our first thought is the image of a tree. Trees have the ability to absorb substances from the environment and convert them to nutritious fruits. We think it’s a metaphor for transforming people’s anxiety to their assets in the future. Therefore, we decided to build a worry capsule tree which can respond to the users and store their worries. This has brought us to the very first stage of our design. If you could store your anxiety into a tree, would you prefer to talk to it or write to it about your worries? In order to know which way makes people feel more comfortable to interact with the tree and release their anxiety, we did user testing with 10 people. Based on our research, more than half of the testers prefer speaking, in particular murmuring to the tree because they believe that creates an intimate relationship between them and the tree. We finally decided to create an interactive capsule tree which can listen to its users and store their worries. Once we decided the main interaction behavior, we built two fast tree prototypes. We ask different users’ opinions on our designs. We decided to follow my (Xiran’s) proposal, a more sculptural design because we believed it looked more interesting and can create more intimacy between our tree and the users. We adapted the design later and finished with the final outcome as shown in the video. In order to have the tree “understands” what the user is talking about and make it respond to the user, we used voice recognition to translate the speech of user into text. The voice recognition is done by p5.speech.library which can translate audio input into text. To store the worries in the tree, I used M-Lab’s database server. Basically, you need to register an account at M-lab, create a database, then a collection. Each account will have an API key, you will be able to use that API key to access your database, upload data and view all the documents you have sent to that database. These two websites provide some very good tutorials on how to set up a database at M-Lab and store data into it. While M-lab’s own sample code is written in Jquery, I used p5.js to do the same thing. I majorly used HttpPost() function to push information (voice text array) into my database. All animations are done by After Effects and are embedded and organized into the interface using p5 DOM library. To add all the light effects to the tree, we used p5.serialport.js library to do serial communication. Basically everytime when we want the computer side to trigger the tree to change its behavior, we send one-byte binary (a number) from the computer to Arduino by doing p5-to-Arduino serial communication. We used Jumbo RGB LEDs, Neopixel RGB LED strips as well as some white Jumbo LEDs. We first tested all the behaviors of the lights by just doing Arduino, using some switches and a sound sensor. After we made sure that everything worked well on Arduino, we used serial communication to allow the computer to control the behaviors of all lights. 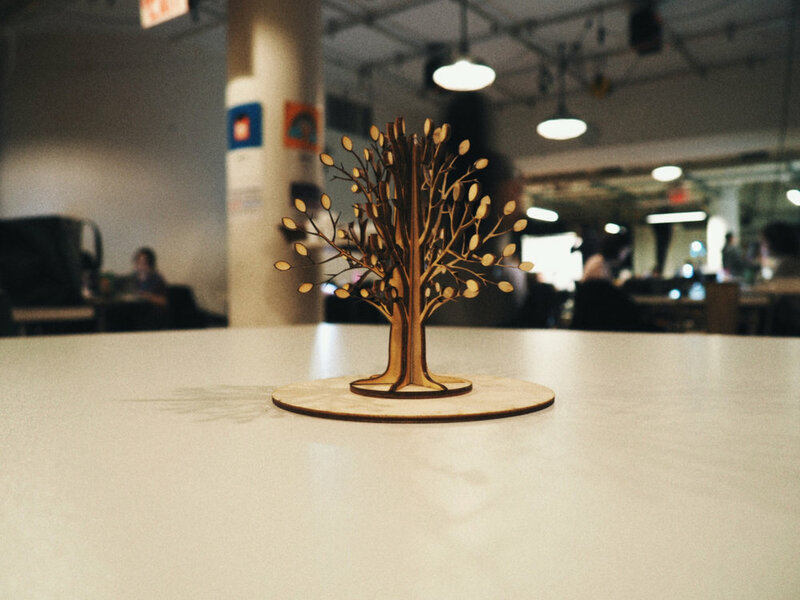 We created the physical tree using laser cutting and soldering techniques.